The giants causeway in Co Antrim are a most unique formation of over 40,000 perfect Hexagonal shaped basalt rocks which are to be seen no where else in the world. It is located in County Antrim on the northeast coast of Northern Ireland, about three miles (4.8 km) northeast of the town of Bushmills. It was declared a World Heritage Site by UNESCO in 1986, and a National Nature Reserve in 1987 by the Department of the Environment for Northern Ireland. In a 2005 poll of Radio Times readers, the Giant’s Causeway was named as the fourth greatest natural wonder in the United Kingdom. The tops of the columns form stepping stones that lead from the cliff foot and disappear under the sea. Most of the columns are hexagonal, although there are also some with four, five, seven or eight sides. The tallest are about 12 metres (39 ft) high, and the solidified lava in the cliffs is 28 metres thick in places. 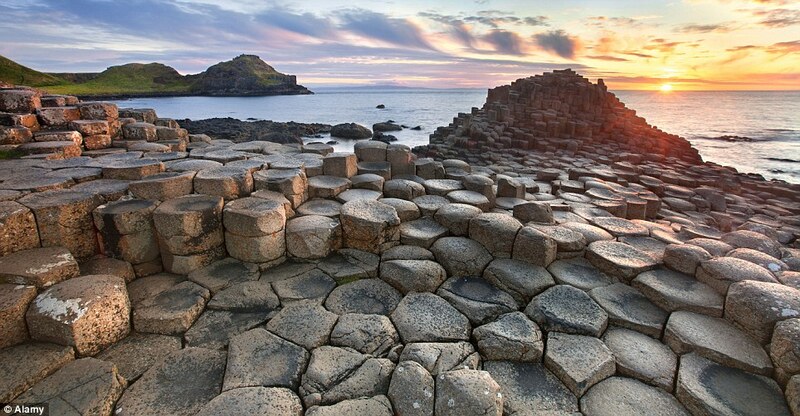 Midway Ireland Tours can bring you to the Giants causeway and along the great Coast Road of Northern Ireland. Join me as I lead you to the very top of Ireland and learn about ancient rock formations, volcano’s and of course the famous Irish giant of Finn Mc Cool!